The memory of brighter days is always a comfort to those in mourning. 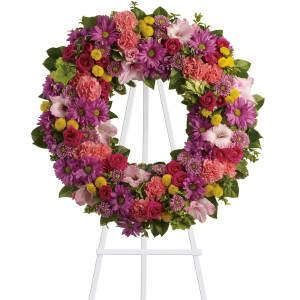 This lovely wreath will display your compassion beautifully. 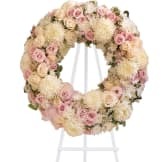 • A standing wreath of dazzling flowers such as green hydrangea, hot pink spray roses, pink gladioli and carnations along with a mélange of multi-colored daisy spray and cushion spray chrysanthemums and greenery is delivered on an easel. 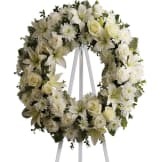 • This wreath measures approximately 25" in diameter. Flowers will be received by a Avink Funeral Home & Cremation Society's staff. 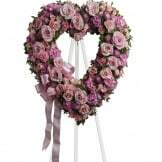 We had our service today and the flowers were there as promised and they were absolutely beautifully stunning. Now the family wished they were plastic because they want to keep them. All of our flowers are designed and delivered by hand from a local florist in in Schoolcraft.